(CNN) - It’s Friday the 13th. There are both Christian and pagan roots for the phobia many have of the day. Briefly, Christians believe Jesus was crucified on a Friday after 13 people attended the Last Supper. The stories of Adam and Eve and the Great Flood also have ties to either the number 13 or Friday. One Norse legend tells of the god Loki who crashed a party of 12 gods, making him the 13th guest, and he tricked the blind god of darkness into killing the god of joy and gladness bringing bad luck to the Earth. Also, many of the Knights Templar were arrested, tortured and eventually executed on Friday the 13th. Whatever you believe, or don’t believe, many people worry for their luck on Friday the 13th. 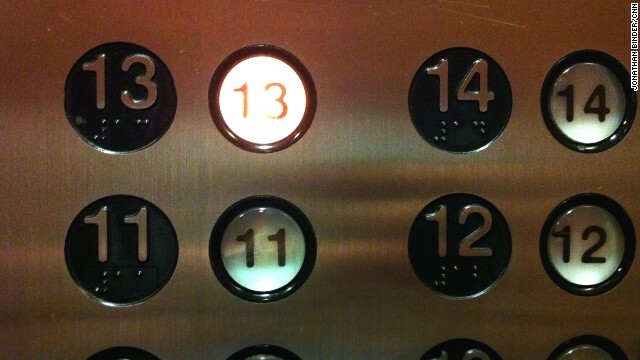 For some it’s a true test of superstitions. For others it’s a source of entertainment. For CNN’s Jim Roope, it’s both. Jim ventures out on the streets of Los Angeles to tempt fate on Friday the 13th. it is a FACT that the Knights Templar were arrested and killed by the Pope on friday 13th. I like the valuable information you provide for your articles. I'll bookmark your weblog and check again here frequently. I'm rather sure I will be informed many new stuff proper here! Good luck for the next! Amazing issues here. I am very glad to look your post. Thank you a lot and I'm looking ahead to contact you. Will you kindly drop me a mail? Yes, dear God. Someone drop this kid a mail. My heart stopped on Friday the 13th during an emergency angiogram. Fortunately, the skilled cardiologist called all the shots and got it going again. We also had to cancel a trip that we had planned for my wife's birthday (Valentines Day). A double whammy. So, am I superstitious? Not at all. It's my birthday! Friday the 13th is never bad for me! Was supposed to close on my new house today...it was postponed. UGH! Let me check the chicken guts on the wall. I hope today is a great day and people that have been bullying me at work will forgive me. Bad for me...got bad news from the doctor this morning....never liked Friday the 13th, but I really hate this one. Wed my beautiful wife on Friday the 13th. The luckiest day of my life. Power went off at my office building. Did Jason get overzealous and cut the line? get out of the building now! run! I was born on Friday the 13th and today is my Birthday, always a lucky day for me! Up until 2012.... Friday the 13ths always brought something bad... ER visits, car accidents, pipes bursting... just to name a few.... This is the first year that I haven't had anything terrible happen on a Friday the 13th! (Now that I've said that... I'd better watch myself...) I do have a very important person in my life having major surgery this evening to remove a lot of cancer.... so let's hope it's a positive outcome and not bad news in the end. Friday the 13th, just another day in the week, month, year of our lives nothing spectacular ever happen, as for Terrance, you might be taken a bit more serious if you at least use spell check, that's the red line under the misspelled word, you do have spell check don't you Terrance, guess your Friday the 13th isn't going so well.. I've been out of work since the beginning of December but I have an interview this morning. Let's hope it's a lucky day. I usually have good luck on Friday 13th. Here's hoping you do too! @Unemployed – good luck with the interview today. Come back and let us know how it went! I wish you luck in getting the job. It is terrible to be without work. Blessings! Superstitious nonsense....it's the 21st century.....who still believes in this stuff? Heh, ask the 75 percent of dumbos who believe in higher powers, angels, and prayer. Amazing how superstition holds on even after humanity has achieved so, so much. I was born on Friday the 13th - I consider it lucky! I got a huge tax bill from 2010 this morning. Later on, I'm getting on my motorcycle, riding fast and taking risks. If I can figure out how to text at the same time, I might try that too. Will it be lucky to win a Darwin award today? Thanks for jumping in on the comments but I hope you take a moment to listen to the piece, it's not about religion. What's been your experience on Friday the 13th? FRIDAY THE 13TH IS MY WEDDING ANNIVERSARY. SO IT IS NOT BAD FOR US. @Terrance – the article states "Briefly, Christians believe Jesus was crucified on a Friday after 13 people attended the Last Supper." the keyword here is BELIEVE....doesn't mean that he "was" as you put it. And not all Christians believe this way. Logically, the last supper, the suffering, the crucification, and the death of Christ were not unlucky things, but were critical components to the fulfillment of their belief system. I would like this article removed. It is false Jesus Christ was not crucified on Friday. It was a Wedsday. Who cares? all the dates were changed anyway to suit the current religious rulers. We don't know exactly when anything in that era actually happened. I believe that the fall of the Knights Templar is the primary source of the Friday the 13th paranoia. T At least that date is documented using a calendar we can understand. How was Jesus crucified on a Wednesday if the last supper was on a Thursday and He was crucified the day after. which as long as I know my days of the week would have been a Friday? I would like your comment removed for not spelling Wednesday correctly. Jesus didn't even exist, so it's irrelevant what day your fairy tale hero supposedly was crucified. "Wedsday"? What day of the week is that? So that's why we celebrate Good Wednesday and Easter goes from Wednesday to Saturday? Hey rocket scientist, Wedsday you are a bright one..
Now you are all making this about religion. Good job in changing the whole discussion. Jesus!